Carved entirely out of salt, the amazing Salt Cathedral of Zipaquirá is one of the most unusual places of worship that you can visit in South America. 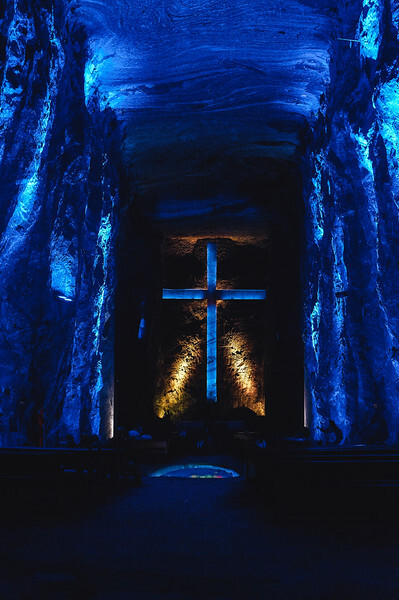 Located 50 km (31 miles) north of Bogota and set 180 meters (590 feet) underground, the Salt Cathedral of Zipaquirá is one of the most unusual places of worship that you can visit in South America. Ever since I first saw photos of this fantastic underground cathedral I’d wanted to see it, but somehow I never managed to do so during any of my previous trips to Colombia. So on our last trip, I made sure to add it to our itinerary. There is some evidence that the native Muiscas were already extracting rock salt from the mountains of what is now Zipaquirá since the 5th century BC. However, it wasn’t until the start of the 19th century that large scale explotaition of the halite mines really started. 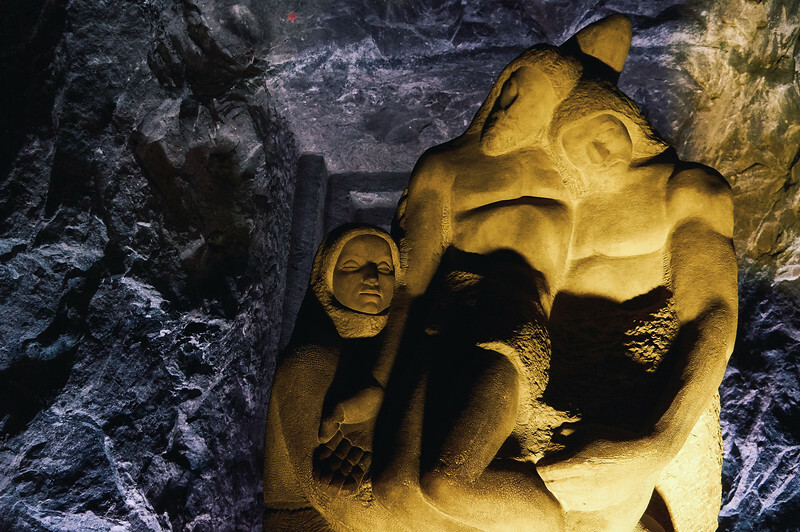 Within the mine, generation after generation of miners devotedly carved an altar where they’d stop every morning before starting their workday to pray for their safety. That’s where the idea to build an underground salt cathedral originated. And in 1950 construction works finally started. That cathedral was inaugurated in 1954 and was dedicated to the patron saint of miners. However, in 1992, almost forty years later, it had to be shut down due to safety concerns. Soon after, construction of a new cathedral started, just 200 feet below the original. For this project, 250,000 tons of salt were removed to make room for this impressive sanctuary. Fun Fact: There are only three salt cathedrals in the world. The other two are located in Poland. By the end of 1995, the new Catedral de Sal was ready to open its doors to visitors. Designed to accommodate over 8,000 people, today it is considered one of the most notable achievements of Colombian architecture. Given its proximity to the capital, it is not surprising that the Catedral de Sal is one of the most popular day trips from Bogota. This underground attraction is located in Parque de la Sal, a big salt-themed complex. You can buy your tickets online or onsite. Also, the entrance fee includes a guided tour of the cathedral (in Spanish or English). When we got there it was a bit crowded, but everything seemed to flow with ease. Since we were not on time for the English tour, we took the first one available in Spanish. Also, there were ramps throughout the park and in the cathedral, so we had no trouble taking our kid around in her stroller. She actually slept during most of the visit. As we entered the building, we first went through 14 small chapels, representing the stations of the cross, which illustrate key events on Jesus’ path to his crucifixion. As we walk into each of them, the guide explains some of the symbolism behind them and some more technical details about how the miners built them. Inside, the place is dark, but the colorful lights add a bit of a surreal touch. 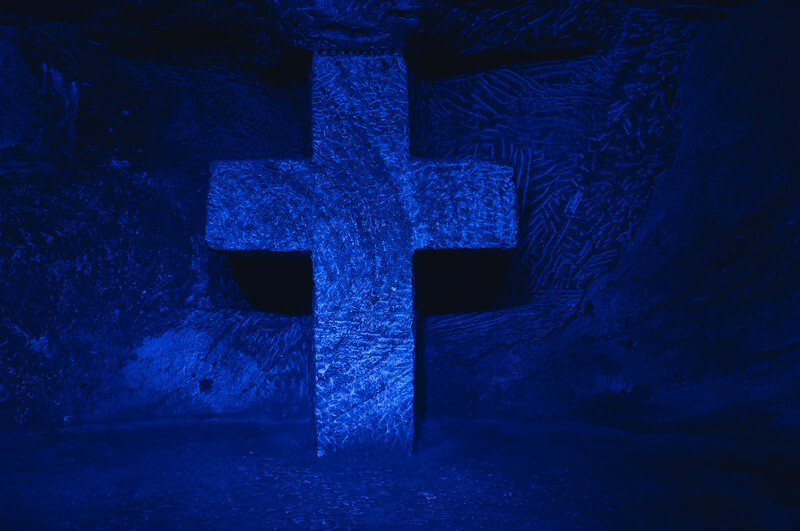 Fun Fact: the Salt Cathedral doesn’t have a bishop so it is not officially recognized as a cathedral by the Catholic Church. Without a doubt, the most impressive sight is the giant cross carved into the back wall in the main room. You feel really little when you first walk in there. At this point, we decided to split from our tour group to explore this area on our own. 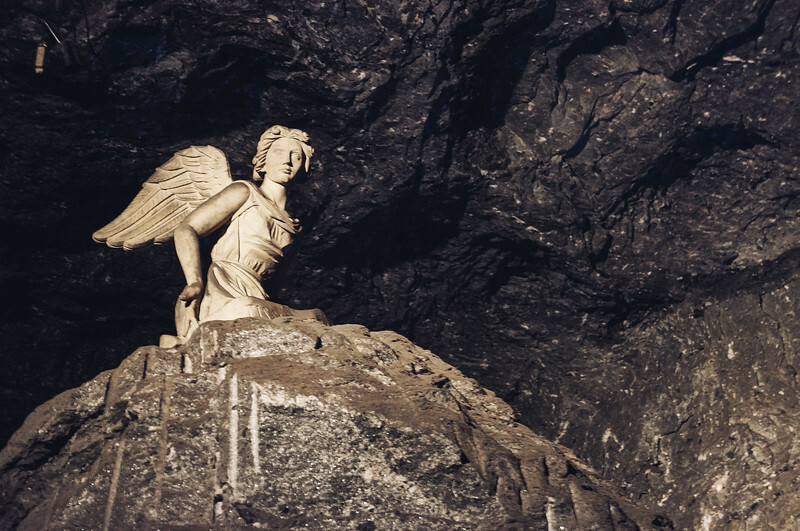 On a few spots, there are also some statues carved in salt and marble. And in the end, you can watch a 3D movie about the history of salt mining in Colombia. We didn’t feel like waiting around for it and decided to skip it. Finally, there is quite a big shopping area where you can buy a souvenir if you wish. From there, you just turn around and walk the same way to get back out. This unique complex is all about mining, geology, and salt, of course! It is actually quite big, modern and well-organised. Besides the underground church, there are a few other minor attractions as well, including a small museum that explains how salt extraction started in this area, a tree-shaped climbing tower, and a zip-lining course. If you need to grab a bite, there are a couple of places to eat as well. From the park, you can also take a train that brings you to see Zipaquirá’s main highlights. Every day from 9:00 am to 5:40 pm. However, keep in mind that there are Catholic church services held on Sundays, which means the cathedral is even more crowded than usual. 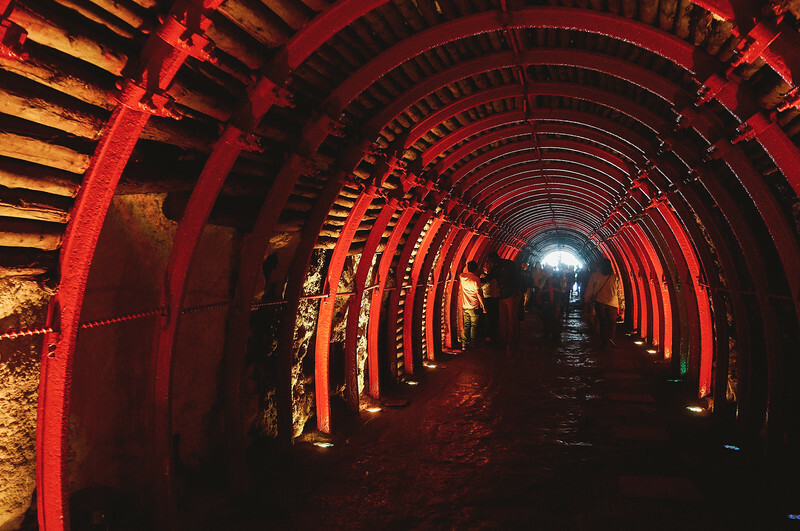 The Salt Cathedral is a favorite destination for both locals and tourists. If you want to avoid big crowds, the best time to visit is either early in the morning or in the late afternoon. Avoid visiting on Sundays, unless you want to attend the church service. In terms of crowds, the worst time to go is during Semana Santa (Easter holidays), which this year falls on April 14th – 20th. Tours in English are available every hour starting at 9 am. Tours in Spanish start every 10 minutes. Audio guides in Spanish, English, German, Italian, French, Portuguese and Mandarin are also available at the entrance. Colombian citizens and residents get a discount upon presenting ID proof. Combo climbing wall & zip-lining COP $17,000 for people 14 years and older, COP $12,000 for children 6 to 13 years old. The easiest way to reach Zipaquirá is from Bogotá and you have many options to get there depending on your budget and needs. To get a bus to Zipaquirá, you need to get to the Portal del Norte TransMilenio station. From there, buses leave frequently, so you probably won’t have to wait much. The ride to Zipaquirá lasts about an hour and costs around COP $4,300 ($1.40 USD / €1.20). The bus stops at the terminal in Zipaquirá and from there it is a 10-15 minute walk up to the cathedral. You don’t get often the chance to ride on an old steam locomotive and this might be yours. If you are visiting the cathedral on a weekend or a national holiday, you can get there on the Turistren. The train leaves from Estación de la Sabana (Calle 13 #18-24) at 8:15 am. Return tickets are COP $60,000 for adults ($19 USD / €17) and COP $54,000 for children ($17 USD / €15). If you rather have a local drive you, you can get a taxi and even negotiate a rate for them to wait for you and drive you back to Bogotá. A round trip to the cathedral should be around COP $300,000 ($96 USD / €85). Alternatively, an Uber could cost you about half of that. For this trip, we had a rental car. We really liked the flexibility of traveling on our own time, especially with a kid that gets motion sickness. Getting to the Salt Cathedral using Google Maps was pretty straightforward. You should download all the details before in order not to use too much data. The parking fee in Parque de la Sal is COP $7,000 ($2.25 USD / €2). Early access: if you want to avoid the crowds, this is the tour for you. They pick you up early in the morning at your hotel in Bogotá, you get to skip the line, and you get an expert English-speaking guide. Easy peasy. Great value: this tour offers some nice perks, like pick-up and drop-off at designated points, small group tour with a guide, and a visit to the town of Zipaquirá; for just $60 USD / €54 per person. Lake Guatavita excursion: if you also want to visit Laguna de Guatavita, a mystical lagoon at the center of many legends, this full-day tour is a great option. It includes transport, all entrance fees and lunch at a typical restaurant. Zipaquirá is a small historic city with colonial architecture. Some of its buildings are considered to be national monuments. In the city center, there are many pedestrian streets and vehicle traffic is restricted, so it’s nice to walk around. Fun Fact: the famous Colombian writer Gabriel García Márquez studied in Zipaquirá during his high school years. If you are looking for a nice place to have lunch, one of the best options in town is Casa del Chorro. They serve tasty Colombian dishes, a good-value lunch menu, and even some vegetarian options. For a sweet treat and great Colombian coffee, try Andreabo Cafe, a cute little place located near the train station. Finally, if you are craving a juicy hamburger, head to La Carreta. If you want to stay in Zipaquirá, there are a few good places to spend the night. For example, Hotel Camino de la Sal is housed in an unassuming building that is just a 15-minute walk uphill to the Salt Cathedral. Inside, this charming little hotel features a modern and bright interior decoration that is very pleasant. However, their biggest plus is the breakfast a large selection of pastries, fruits, and juices; so you can start your day in style. Rates start at about $45 USD / €40. Another great option is Hotel Cacique Real, which is set in a beautiful colonial house with a lovely inner courtyard. With its mix of antique details and contemporary amenities, you can enjoy an authentic stay in Zipaquirá in total comfort. Plus, with rates starting at about $40 USD / €36, you are sure to get a great value for your money! Finally, if you are looking for a more budget-friendly option, try Zipaquira Coffee Town hostel. With its funky and colorful vibe, this hostel is located just a couple of blocks away from the train station. Rooms are nice and clean, common areas are cozy, and they serve a fantastic free breakfast. Rates start at $11 USD / €10 for a bed in a dorm room and $29 USD / €26 for a private room. As mentioned before, the main attraction in Zipaquirá is by far the Catedral de Sal. But if you decide to stick around, you’ll see that the town is quite pleasant and there are even a couple of hidden gems worth discovering. For example, I just found that right near the cathedral there is an underground spa in another section of the mine. I wish I’d known about Esensal when we were there because it looks like quite a unique and soothing experience. Oh well, maybe next time! Jaime Duque Park: with its full-scale replica of the Taj Mahal, this little-known amusement park is full of oddities. There is also a palace of mirrors, some dinosaurs that kids can climb on, and monorail-mounted bikes. Lake of Guatavita: located in a nature reserve, this small lagoon is full of mysticism. Legend has it that there is gold under its water, so it became known as the site of ‘El Dorado’. Nemocón Salt Mine: the second-largest salt mine in Colombia is a lot less touristy than the one in Zipaquirá. You will still find colorful lights inside, which combined with their reflections on the brine pools create a surreal atmosphere. 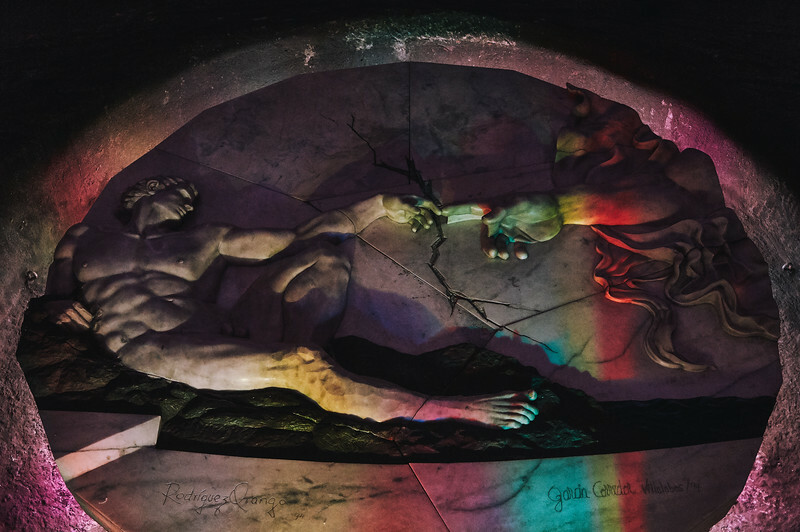 Have you visited the Salt Cathedral of Zipaquirá? How did you like the experience? Leave a comment and let us know!